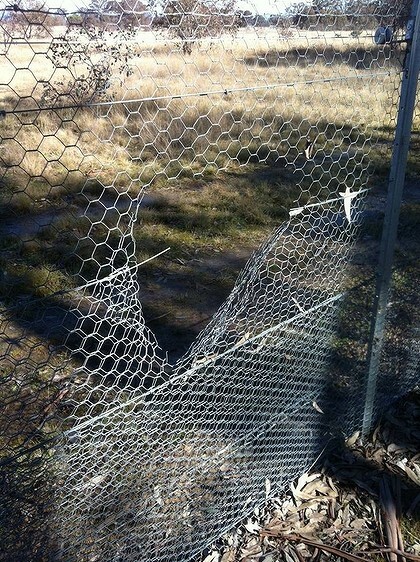 Hole in predator-proof fence at Mulligans Flat Sanctuary. “In what’s been described as an act akin to ‘eco-terrorism,’ more damage has been done to the predator-proof fence at Mulligans Flat Sanctuary. The damage appears to have been made by a rogue group of activists – with Animal Liberation ACT again denying any involvement.” Full story HERE. There is growing outrage in the community over ongoing vandal attacks and death threats issued to Australian National University researchers. But anti-kangaroo cull protestors say they are unrepentant and have nothing to lose. A spokeswoman from the Australian National University says anti-kangaroo culling protestors verbally intimidated and prevented research staff from leaving the Mulligans Flat Sanctuary in north Canberra on Sunday. The university says the researchers were tracking Tasmanian bettongs and had nothing to do with the ACT Government’s annual cull of kangaroos. ANU says its researchers should have the right to carry out their work in a safe and secure environment. Ranger in charge Peter Mills says the ongoing vandalism is heartbreaking and he is outraged scientists have also been harassed and intimidated. “The protesters vehicle blocked the sanctuary gate and they gestured to them like, we are going to cut your throat,” he said. But Animal Liberation’s Carolyn Drew says the hostile exchanges are justified. “It can be defined as intimidation, but I think it is more direct speaking,” she said. Ms Drew says she doesn’t think protesters will jeopardise the credibility of the anti-kangaroo cull movement. “I don’t think anything really damages our cause because we are the minority in this country,” she said. Meanwhile, scientists say they are optimistic all 17 of the Tasmanian bettongs recently released in a Canberra sanctuary are alive, despite vandal attacks to the predator proof boundary. It comes as police assess the damage and investigate the incident. The Tasmanian bettongs were released into the Mulligans Flat Woodland north Canberra last week, marking the first time in a century that the rabbit-sized kangaroos have set foot on the mainland. Vandals have since cut the sanctuary’s $1.3 million predator proof fence in at least 30 locations and destroyed padlocks. Professor Tony Peacock says they may be forced to relocate the bettongs to a safer location. “It is a world leading research site,” he said. There are no reports of foxes inside the sanctuary at this stage, however rangers are continuing baiting and surveillance for feral animals. Professor Peacock says feral animals form a threat to the bettongs. “Some of them have pouched young and one fox coming in for one night is enough to kill half those,” he said. But Animal Liberation ACT is pledging ongoing civil disobedience to coincide with the cull of 2,000 kangaroos in the Territory. The organisation has claimed responsibility for unearthing and photographing remains of culled kangaroos at two sites in Canberra over the weekend. However, it is not known who sabotaged security and cut the predator proof fence surrounding the sanctuary at Mulligans Flat Nature Reserve. The scientific board that oversees the sanctuaries management says it is considering offering a reward for tips offs about the vandal attacks. Animal Liberation’s Carolyn Drew says she is sympathetic to vandals’ motivation, concerned about kangaroos trapped inside the sanctuary. “I can understand the concerns at Mulligans Flat for the bettongs,” she said. Police are calling for anyone who witnessed suspicious activity in the area over the past few nights to come forward. Daring Daytime Dog Liberation at Green Hill Breeders in Italy! ITALY! THE WHOLE WORLD IS WATCHING! They have broken through or climbed over the gates networks. They made their way inside the farm and opened the cages, taking away puppies, pregnant and all the little dog beagle who managed to find. It ‘s over a raid in the breeding of dogs to search for the event organized by Occupy Green Hill to ask – again – the closure of the ownership structure of the American Marshall. The procession started from the parking lot of PalaGeorge, was attended by about 1000 people came from all over North Italy and also from the center. By way of the Craft sepentone deflected Instead of going towards Via San Zeno, the main road leading farm where he was deployed the cordon of police, groups of protesters have cut through the fields and the lanes, coming close to the fences. From then on, the situation has become confused with groups of demonstrators who tried to open gates in the perimeter and teams of mobile riot police and police deployed to contain them. On the side of the gates, however, the protesters have opened a breach in the fence and broke into the farm, going into the sheds and taking away at least thirty dogs. At the end of the day, the police had arrested 12 people from the local police station Montichiari were transferred to Desenzano. Some protesters said they had suffered violence by some officials. Green Hill 2001 is a company located in Montichiari (Brescia), which breeds beagle dogs to vivisection labs. From this farm, more than 250 dogs each month end in the enclosures, in the hands of vivisection and operating tables.Dogs are born to die and sentenced to suffer. For some years now Green Hill was acquired by an American firm called Marshall Farms Inc. Marshall is a name infamous throughout the world as it is the largest “factory” dog lab exists. The Marshall beagle is actually a standard variety. For a price from 450 to 900 € you can buy dogs of all ages. Who is willing to pay more can also buy a pregnant mother. For Green Hill and Marshall Farm animals are just merchandise, objects to breed and sell, without the slightest scruple about pain and suffering – mental and physical – that they will suffer.